8.3 U 1 ​Light-dependent reactions take place in the thylakoid membranes and the space inside them. 8.3 U 2 ​Light-independent reactions take place in the stroma. 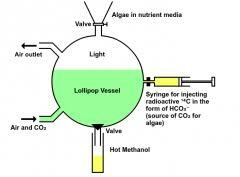 The light-independent reactions use the products produced by the light dependent reactions and CO2 to produce glucose. 6 CO2 are required to create one 6 carbon sugar molecule. 8.3 U 3 ​Reduced NADP and ATP are produced in the light-dependent reactions. 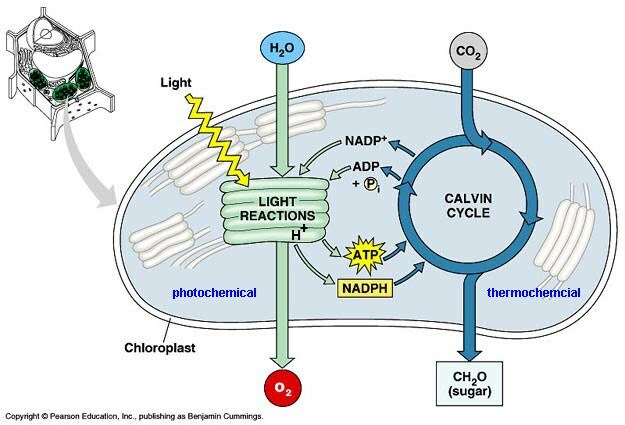 ​This process is the first stage of photosynthesis in which light energy is converted into chemical energy (NADPH and ATP). These products will be used in the light independent stage. 8.3 U 4 ​Absorption of light by photosystems generates excited electrons. 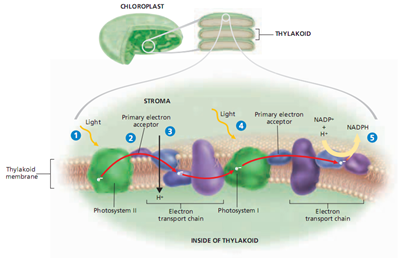 Chlorophyll molecules are grouped together into photosystems contained within the thylakoid membranes. 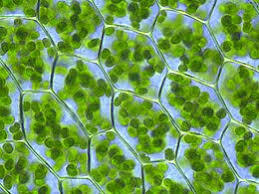 Chlorophyll a within the photosystem II (PS II) absorbs a photon of light (most efficient at 680 nm). This photon of light excites an electron from the chlorophyll a molecule to a higher energy state. The chlorophyll is now in a photoactivated state. The excited electron is released by the oxidized Chlorophyll a molecule to the primary electron acceptor in photosystem II. 8.3.U 5 ​Photolysis of water generates electrons for use in the light-dependent reactions. The lost electrons are replaced by the splitting of water through a process called photolysis. During this reaction oxygen is produced and released as a by-product. 8.3 U 6 ​Transfer of excited electrons occurs between carriers in thylakoid membranes. Electron Carriers: (plastoquinone (PQ) --> cytochrome complex b6f --> lastocyanin --> PS I). 8.3 U 7 ​Excited electrons from Photosystem II are used to contribute to generate a proton gradient. 8.3 U 8 ATP synthase in thylakoids generates ATP using the proton gradient. 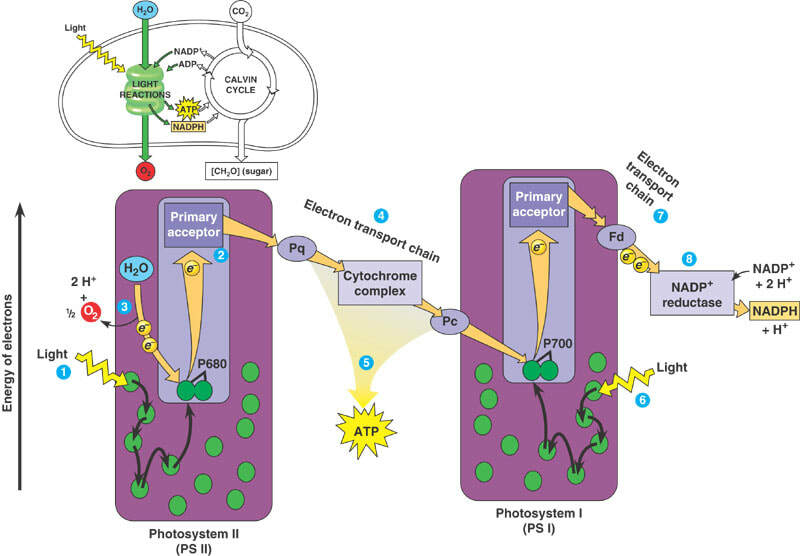 The production of ATP from ADP and phosphate using energy derived from light is called photophosphorylation.. Photophosphorylation occurs on the thylakoid membrane of the chloroplasts. As electrons pass along the electron transport chain between PS II and PS I, the electrons release energy that is used to pump protons from the stroma into the thylakoid space. This builds up the concentration of H+ within the thylakoid space creating a proton concentration gradient. Protons will flow across the membrane from the thylakoid space to the stroma, through ATP synthase following the concentration gradient. As the protons flow through ATP synthase, the energy released from the flow of protons is used to combine ADP and inorganic phosphate to form ATP(photophosphorylation). This whole process of producing ATP is called chemiosmosis. 8.3 U 9​ Excited electrons from Photosystem I are used to reduce NADP. This electron is passed along a second electron transport chain (includes ferredoxin) until it is accepted by the final electron carrier NADP+. A second electron that follows the same path is also accepted by NADP+. These electrons reduce NADP+ to form NADPH (NADP+ + 2e- + H+ --> NADPH). Since the electrons are not returned to photosystem II, this path for making ATP is called non-cyclic photophosphorylation. If NADP+ runs out and it cannot accept the excited electron from photosystem I, electrons return to the electron transport chain (PQ) where they can reflow back to PS I thus pumping more protons into the thylakoid space; producing more ATP. This is called cyclic photophosphorylation. 8.3 U 10 ​In the light-independent reactions a carboxylase catalyses the carboxylation of ribulose bisphosphate. One CO2 molecule enters the Calvin cycle and combines with a 5 carbon molecule called Ribulose bisphosphate (RuBP) to temporarily form a 6C molecule. This reaction is catalyzed by the enzyme RuBP carboxylase (rubisco). This immediately breaks down into two 3C molecules called glycerate-3-phosphate (GP). 8.3 U 11 ​Triose phosphate is used to regenerate RuBP and produce carbohydrates. 8.3.U 12 ​Ribulose bisphosphate is reformed using ATP. Two TP molecules are used to produce one six carbon glucose phosphate molecule, which can eventually be combined with other glucose phosphate to form starch. The other ten TP (3C) molecules are used to regenerate six RuBP (5C) using 6 ATP molecules for energy. 8.3 U 12 ​The structure of the chloroplast is adapted to its function in photosynthesis. 8.3 A 1 ​Calvin’s experiment to elucidate the carboxylation of RuBP. ​The light independent reactions are also collectively known as the Calvin cycle – named after American chemist Melvin Calvin. 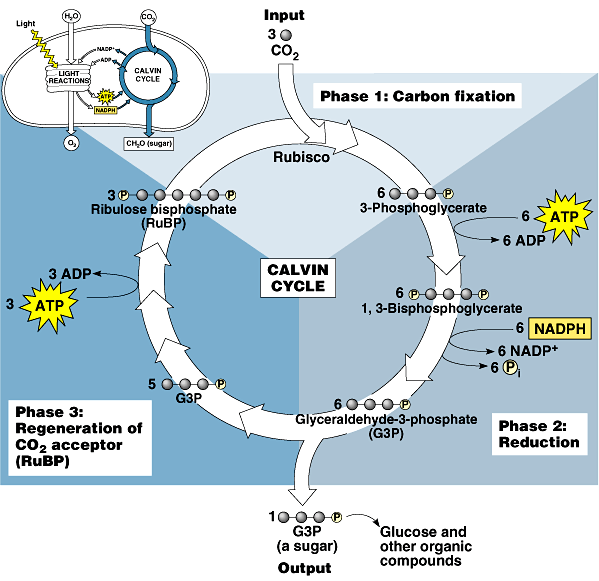 Calvin mapped the complete conversion of carbon within a plant during the process of photosynthesis. ​The experiments performed by Melvin Calvin explained the process that plants use to make food. Radioactively labeled carbon was introduced into algae and analyzed to see where it would be found in the cells by the use of two-dimensional paper chromatography. The results of these experiments showed that carbon dioxide was converted to carbohydrates during the light-independent reactions of photosynthesis. 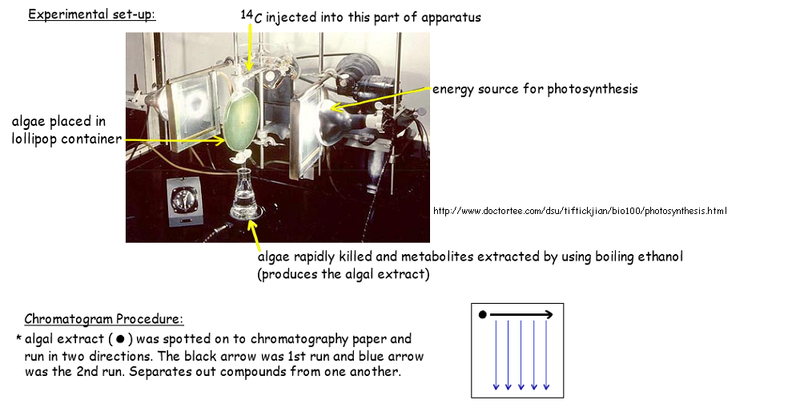 8.3 S 1 ​Annotation of a diagram to indicate the adaptations of a chloroplast to its function. Learn how the light dependent and light independent cycles work together to create glucose for plants. We get energy by eating other organisms, but plants don't have to do that. They can build their own food out of water, carbon dioxide, and sunlight. I'm sure you've heard of photosynthesis before, but let's take a look at some of the finer points, shall we?